Kerja Sama Mendirikan Klinik Dokter 24 Jam Dan Pusat Terapi Tumbuh Kembang Anak Berkebutuhan Khusus / Autis Bersama Pemilik Tempat Dalam Rangka Peduli Kesehatan Bangsa Indonesia Dan Generasi Muda Autisme. 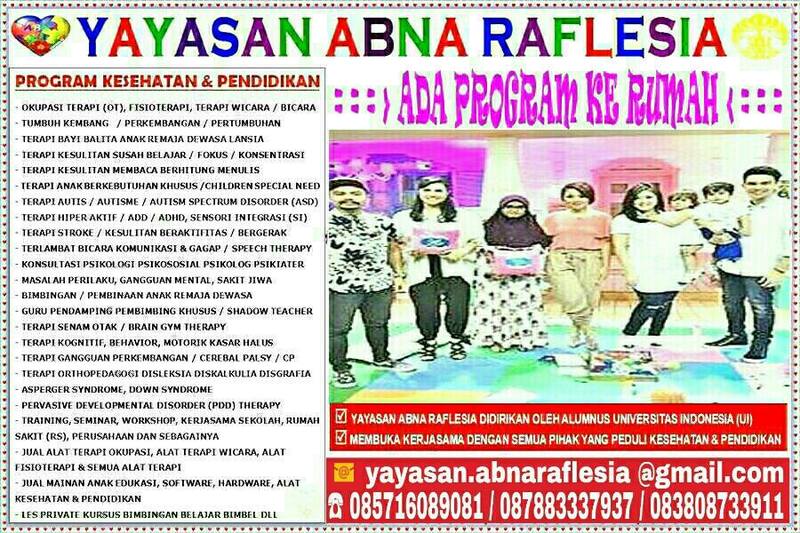 Establishing Cooperative Clinic 24 Hours And Therapy Center Growth with Special Needs / Autism Joint Owner Points in the Context of Health Care for the Younger Generation Nation Indonesia and Autism. What is the most important thing to be aware of. As a physician who has been the practice in some clinics 24 hours we saw a residential area and the best choice to open a 24-hour clinic. we've paraktek in an elite area cibubur clinic patients and found quite a lot. So take a look at how many houses in the compound eg 1000 home. Business clinic 24 hours is a long term business. Future building could reach 1 year. If you want to build a 24-hour clinic could be that you have to be ready breakeven or loss in the first 6 months. There are approximately 7 patients per day. Turnover at these clinics range from 8 to. 10 million per month. There is also another clinic where we worked the income of about 25 million per month. However, one thing that you should remember is all that we discussed above are kilnik that has more than 1 year open. 3. Want to work with a doctor or someone who is experienced in the clinic 24 hours with the principle of win-win solution. If you have these three things above your stay call a doctor or your relatives and start your clinic. If you combined all of them can reach 5-12 million. However, if these are too big you can outsmart by purchasing equipment gradually. Everything above arrangements will be made by the manager of the clinic, but the funds remain from you. In addition to the above arrangement permits management clinics also are those who are able to make the financial accounting system clinics, diagnosis books, drug stock book, all the clinic letters of administration (Recipe doctors, Certificate of healthy / sick, medical records) etc..
we are looking for cooperative partners who own the building, shop or house located in a strategic area in the elite housing in Jakarta, Depok, Bogor, Tangerang, Bekasi (the number of houses 500-1000 home) to work together to build a clinic. Clinic which we plan to consist of a 24-hour doctor and treatment children with special needs / autism. You as a provider of capital and the place and we as managers. For more information please make an appointment to directly meet. Establishing Cooperative Clinic 24 Hours And Therapy Centre Children with Special Needs / Autism Joint Owner Points in the Context of Health Care for the Younger Generation Nation Indonesia and Autism.